Reykjavik, the capital of Iceland, may be a small city by international standards, but it has a lot going for it. Like any European capital, the city is packed with great restaurants, lively bars and a good range of hotels for all budgets. The city hosts a number of annual festivals, several excellent museums and a great music and cultural scene. Reykjavik’s architectural style of brightly coloured buildings, with traditional corrugated iron-clad houses alongside ultra-modernist blocks make it a curious and explorable city. But perhaps even more importantly, virtually every northern lights tour starts and ends in the city. Most visitors assume Reykjavik will be a stopping-off point to explore the rest of the island and see the lights, but with stunning scenery right on the city’s doorstep you can find some excellent viewing spots just a short drive from your hotel. Most people come to Iceland hoping to see the northern lights, and there are many spots near Reykjavik from where it’s possible to catch a great light show, if the conditions are right. Grótta lighthouse, to the northwest of the city, is where the skies are darkest and where the sea meets land, creating a unique atmosphere. If the northern lights are visible here, you might see some spectacular reflections in the water. The area is also free to access. The lighthouse is a 10-minute taxi ride from Reykjavik City Hall. Öskjuhlíð Hill is the closest viewing site to central Reykjavik, close to Perlan on a hill behind Hallgrimskirkja. Here, the lights reflect and dance on the snow on the surrounding mountains and can be wonderful to see. Take bus number 18 from Hlemmur Bus Terminal to Perlan (a single fare costs ISK 440 each way). As the hub for your holiday, Reykjavik has a lot going for it. Being compact but with many hotels and attractions, it’s easy and convenient to get around. And unlike some of the country’s other viewing locations, there’s no need for off-road vehicles to catch a light show! Reykjavik is where you’ll find experienced northern lights tour companies, and there is also a specialised observer base for the lights. Perhaps unsurprisingly, the Icelandic Meteorological Office is one of the world’s leading authorities on aurora forecasting. 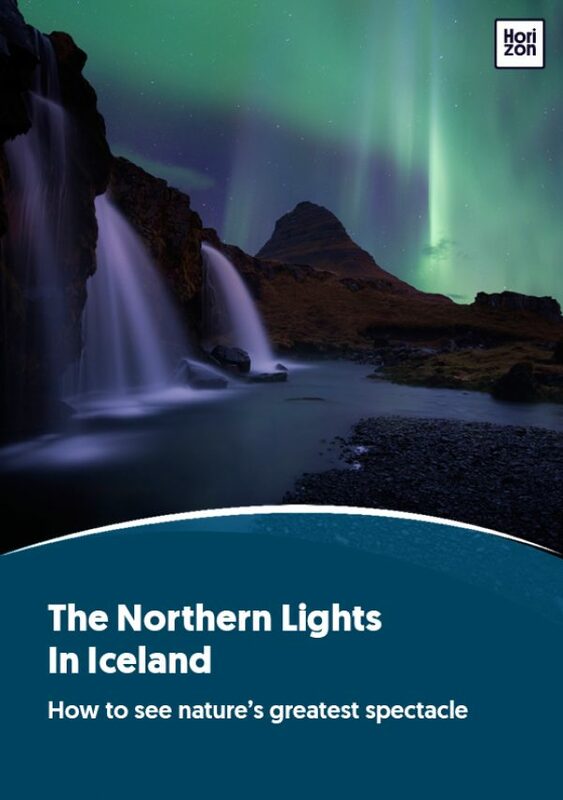 Experienced forecasters use satellite images to provide a live picture of where to find the northern lights across Iceland on their website: http://en.vedur.is/weather/forecasts/aurora/. The city is close to Iceland’s only international airport and there are domestic flights to other destinations across the island. There are drawbacks to light spotting in Reykjavik of course. As a small but buzzing city there is some light pollution, which can make it less than ideal. That said, when the aurora forecast looks especially good, city authorities will sometimes switch off the street lights to give residents a clearer view. Remember that Iceland is an increasingly popular and busy place, and during the autumn and winter months the private and small group tour companies are regularly fully booked. And you won’t be the only one chasing the lights--there will be lots of coach parties out hoping to catch the light show. Of course, being a natural phenomenon there’s no guarantee that you’ll see the lights. But whether you see them or not, there are many other attractions in and around Reykjavik to make for a wonderful holiday. Best-known is the Golden Circle tour of the region’s waterfalls, lagoons and geysers. The tour typically lasts a full day, but half-day tours are available. In the city there’s Hallgrímskirkja, a modern church which offers uninterrupted views across the city and the surrounding natural sights (entrance ISK 900; more information at https://www.hallgrimskirkja.is). Reykjavik's annual festivals are a mainstay of the city’s cultural scene. The world-famous Iceland Airwaves festival takes place in early November, in late November there’s Christmas carols at at the Lighting of the Oslo Christmas Tree and the Winter Lights Festival in early February sees the city’s attractions covered in glowing lights. At the Secret Solstice Festival (mid-June, during the summer solstice) top musical acts play over 48 hours during constant daylight. Shortly after, Iceland celebrates its National Day (June 17) when the city centre comes alive with parties, food stalls, and re-enactments of Viking battles. Reykjavik boasts several excellent museums, many of which are dedicated to the country’s Viking past, including Arbaer Open Air Museum (entrance ISK 1,600) which houses an authentic Viking settlement; The Settlement Exhibition - Landnámssýningin (entrance ISK 1,600) which is an interactive museum dedicated to the city’s Viking legacy; and Culture House - Safnahúsið (entrance ISK 2,000) which displays artefacts of historical significance. For something a little more unusual there is the Phallological Museum, dedicated to more than 200 penises of animals, fish, and humans. More information is available at http://phallus.is/en/ (entrance ISK 1,500). And of course there’s plenty of shopping to be had on Iceland's main shopping street, Laugavegur, in the centre of the city.